Zoetrope Dreamscape and Cinnamon Somerset walked to Cinnamon's station. Zoetrope smiled at Cinn and said "I'm so very proud of you!" Cinn beamed. She was proud of herself as well. She had learned how to use these computers in less than a month. It was an amazing accomplishment for anyone, let alone someone from 1885. 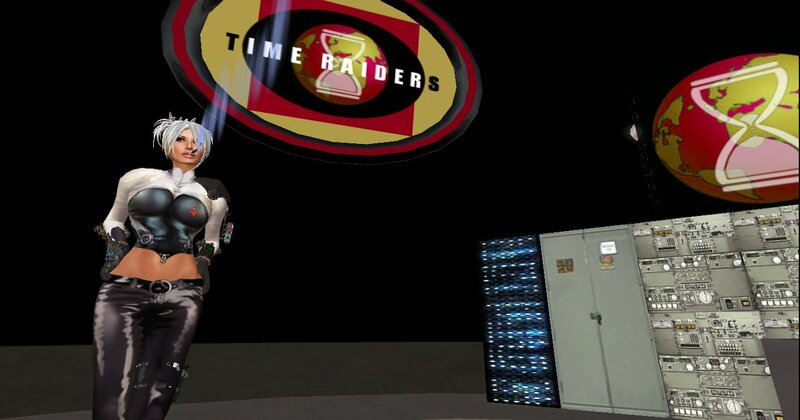 "Thank you, Zoetrope" Cinn immersed herself in the technology and was able to run the Time Raiders Time Tunnel herself. She was after all, on a mission to find her husband Professor John Barrington Somerset. Cinn intended to use these machines to find and retrieve him. "Now you'll have all the tools you need to develop your time travel theories, Doctor Somerset." "Yes, this is absolutely wonderful!" Cinnamon said. There was one thing Cinnamon was curious about..."Dr. Dreamscape... who is that blonde woman you captured?" Zoetrope frowned, "That would be Ava Zenovka." 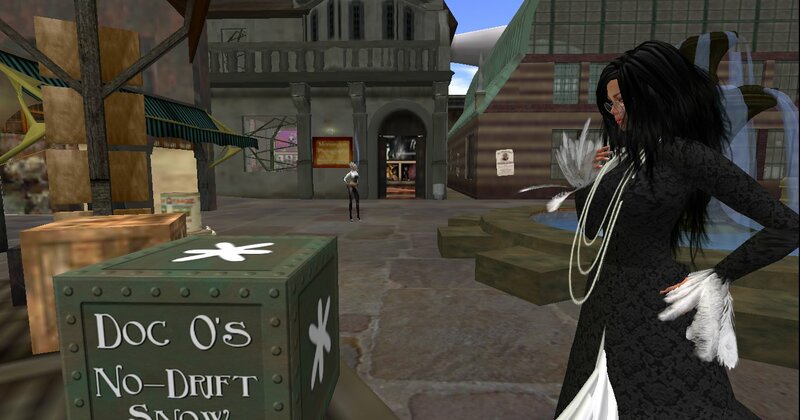 Cinn nodded and said, "I've seen her in New Babbage... it was a few days before you and I met. Is she dangerous?" Cinn looked at Zoetrope and waited. Zoetrope sighed deeply and looked at Cinn, "VERY dangerous...stay clear of her, Cinnamon." Cinn paused, then looked down at her control panel "Yes Doctor." There was an awkward pause, then Cinn decided to ask Zoetrope her routine daily question "When may I look for my husband, Doctor." Zoetrope looked away and rolled her eyes. She was so very tired of this. Damn her persistence, she thought. She looked down, then at Cinn and decided to lie this time, "I suppose I can reveal this to you now..."
"Ava is the key to finding your husband" Dreamscape lied. She told Cinn to stay away from Ava and that she was VERY dangerous. She gambled that Cinn would stay away from a menacing TF10 agent and do as she was told. "Just stay away from her, Cinn. Leave her to me." Cinn looked back at her computer console. "This...TimeForce 10...you say they are evil?" she asked Zoetrope tentatively. "Cinnamon...you're ill-equipped to deal with these people." Cinn opened her mouth, about to respond, but thought better of it. "Yes, Doctor" she replied obediently. Satisfied that her lies worked, Zoetrope walked across the room to another computer console. Cinnamon turned her head for a quick glance at Zoetrope. She was on the other side of the room. Cinn thought a moment and used the computer to find Ava Zenovka's prison cell. If this Zenovka woman knew where her husband was, she HAD to know. 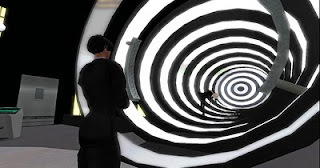 Readers may visit the Time Tunnel by teleporting (or timeporting) to the following SLurl http://slurl.com/secondlife/Caledon%20Mayfair/40/243/24. You'll land at my Steampunk home in Caledon Mayfair. 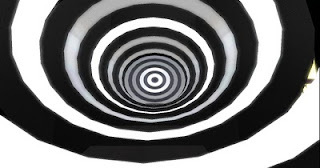 Then take the elevator to the Time Tunnel level. The hum of the Time Tunnel grew louder and higher. Another 60 seconds and the Tunnel would be ready. Phin stood up and stepped in front of the entrance to the Tunnel. He often did this when agents returned and could sometimes catch a brief scent, hear a sound, or feel a rush of air from wherever the agent was time-ported. It was another little ritual for him. Zoe shook her head but smiled. Her brother's familiar habits were amusing to her most times. Phin had to speak loudly over the hum of the Tunnel. He turned his head toward Zoe and shouted "Here she is!" Ava was materializing before their eyes. So far so good. An alarm sounded. It was loud and startled both of them. "What's wrong!?" Phin now shouted over the noise of the Time Tunnel and the alarm. "1202 Alarm!" Zoe worked the controls while checking monitors. While she did so, she managed to turn off the alarm. A 1202 Alarm was an unresponsive computer. 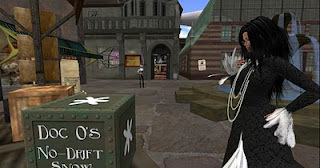 They now had a time-portal open in Caledon Mayfair with no means to control its size, scope, and no way to stop it. Zoe looked up and saw Ava suspended. Ava appeared to be in pain, her mouth was open as though she was yelling something, or was it a scream? It was the most awful sight she'd ever seen as TF10 Director. Phin started to step toward Ava. Phin shouted at Zoe, "Something...or someone has her!" "Don't take another step, Phin!... I won't lose you, too!" Zoe looked at her station, then up at Phin "We have to let her go!" Phin gave an angry look to Zoe. Zoe shouted "If we don't let her go now, the Tunnel...and whatever has her..."
"Two forces will tear her apart!" Phin finished. "Do it!" Let her go!" Phin's shoulders slumped as she watched Ava disappear. The computer errors cleared and the Time Tunnel started its shutdown sequence. "We need to find her now!" Phin said as the noise of the Time Tunnel died down. 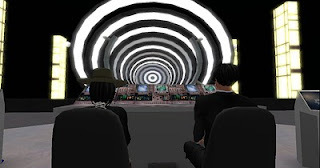 Zoe stared blankly at the monitors...then slowly said... "I don't think we have to look very far." Phin blinked and then asked "Dreamscape?" "If we find our cousin we'll find Ava." then Zoe frowned, "The quickest way to find Dreamscape would be through Zabrina... but of course we're not on speaking terms." Zoe turned to Phin and smiled "She'll still speak to her brother though." "I'm not sure about that, Z." Phin said. Zoe nodded and looked straight into Phin's eyes. "For Ava." Phin read his sister's face and knew better than to counter her determination. Raymond the Robot has another announcement for readers of Zoe Connolly's blog. Monday July 19th, 2010. 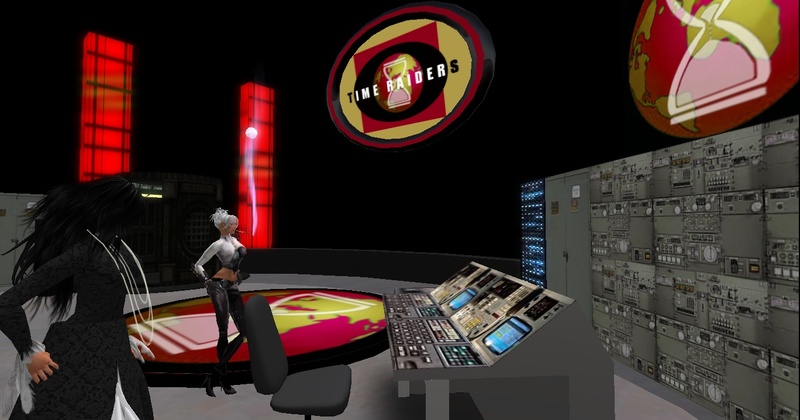 Readers may visit Zoe's TimeForce 10 Time Tunnel by teleporting (or timeporting) to the following SLurl http://slurl.com/secondlife/Caledon%20Mayfair/40/243/24. You'll land at my Steampunk home in Caledon Mayfair. Then take the elevator to the Time Tunnel level. Cinnamon looked at Zoetrope a few moments and said "May I assume you have good reason for your introduction?" Zoetrope replied through a laugh "You're quite blunt for a Victorian era woman." Cinnamon blushed... then blinked at her. "A Victorian era woman?" Zoetrope decided to get to the point. "You've been under surveillance for quite some time, Dr. Somerset." Cinnamon was in shock but tried not to show it. Her eyes darted from one side of the market square to the other. Zoetrope noticed. "I assure you, Cinnamon...we're quite alone." Cinn didn't like that sentence or the way she said it. "None of us have the luxury of having all the time in the world. At least not yet. So allow me to give you the courtesy of directness." Cinn thought about how she could politely excuse herself from this strange conversation and run home. "I know what happened to your Husband,' Zoetrope said. Cinnamon's heart seemed to pound so hard she thought it would burst. She managed to stutter "Wha... you... you know about John?" Her mouth went dry and suddenly found it difficult to swallow. Zoetrope nodded slowly "...and I know a way to help him... and help you find him." Zoetrope then touched a small contraption on her left forearm. Cinn heard a voice emanating from the device that asked "yes, Doctor?" 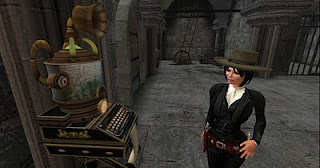 Zoetrope spoke one word into the device "Now" and within seconds she faded from sight. Cinnamon turned on her heels looking frantically about the Market Square. No one could run that fast and no one else was visible. The last person she saw disappear like that was her husband John. Seconds later she began to feel strange, as though falling from a running horse... but never actually hitting the ground. She felt nausea come over her. She tried to reach out and grab the cart in front of her for support, but couldn't move. Cinn cried out for help, then for her beloved John. The world seemed to dissolve around her... then a swirling tunnel vision... and finally... blackness. The continuing story of Doctor Dreamscape and her vendetta against TimeForce 10. One survivor from a doomed starship. Raymond the Robot, with a message about Zoe Connolly's blog. Doctor Dreamscape green-lights the making of a reality show at her secret lair. But does Miss Minion reveal too much? 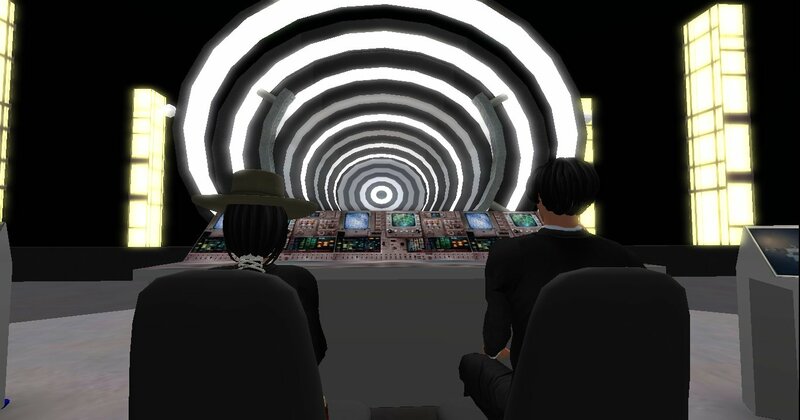 Doctor Dreamscape's Minions find the location of the Time Force 10 Headquarters and are about to force a power overload of the TF10 Time Tunnel. The story details the adventures of several young American boys who volunteered for the French military before the United States entered World War I. Doctor Cinnamon Somerset entered the market square satisfied with her recent find of electrical parts. Now it was time to look for a few items for her apartment. It was nice to take a break from her research, even if it was only for an hour here or there. Doctor Somerset was sure she was close to duplicating her husband's experiment. It had taken her a solid month to reach this point. Perhaps another month would be enough time to proceed. She was not as desperate as when she started re-building the machine, but she never lost her sense of urgency. She looked at the cart before her and was about to pick up a box to inspect it, when out of the corner of her eye she saw movement. Somerset turned her head and spied a white-haired woman dressed very strangely. 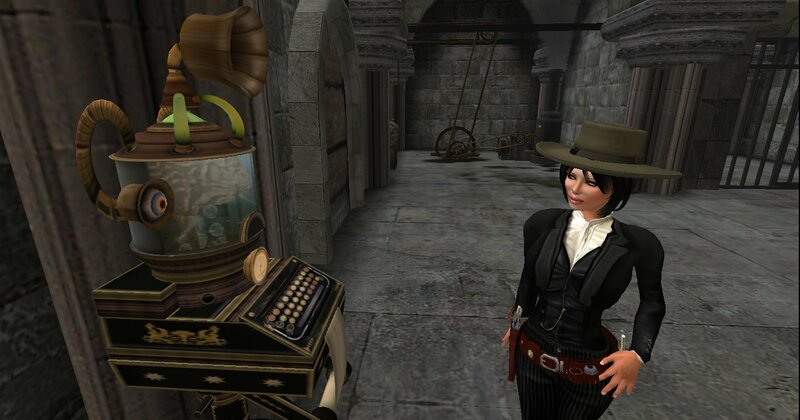 Certainly dressed inappropriately for Victorian New Babbage. "What on Earth!" she thought to herself. As soon as that question crossed her mind, the woman spoke. The stranger smiled and slowly approached her. Something about this women was not quite right. Cinnamon fought the urge to step back, but not wanting to appear rude she stood her ground. "How does she know my name?" she thought. "I'm afraid you have me at a disadvantage, Miss. You know my name but I do not know yours." The stranger exhaled cigar smoke and looked her over for a moment. She gave Cinnamon a mischievous smile that reminded her of Lewis Carroll's Cheshire Cat. "Allow me to introduce myself... I'm Doctor Zoetrope Dreamscape." Arch enemy of Zoe Connolly and TimeForce 10. Fringe scientist. Specialist in telepathy, psychokinesis, reanimation, teleportation, Inter-dimensional travel, Time Travel. KC's father discovered her involvement in the French Resistance when they both learned of JP's death at the hands of the Gestapo. JP's team, recognizing KC's contributions and leadership over the previous 2 years, went directly to her for guidance. Her father was in shock and didn't say anything to her about her involvement for weeks. He needed to grieve over his son first. The war took a huge toll on her family, and... "No!" she told herself. She pushed thoughts of her father aside for the moment. She couldn't bear to think of all that now. Even two years later it was as painful as two days after. As sad as her brother's death was, KC thought of the others she once knew who were dead or missing since Nazi Occupation. So many names. So many faces. Her latest missing friend was her British contact, Ian. She knew that something very big was to happen within the next few months. But what exactly? Was it the invasion the Nazi's so feared and the French wanted so much? She was ready for it, but on what day? She rowed her boat closer to shore thinking of his handsome face, but also very worried for his safety. KC had lost contact with him almost two weeks earlier. It was vital to the Resistance to find out what was happening. There was something more. Before the chaos of the invasion intervened, she wanted to be in his arms, kiss him once again, rest her head on his shoulder and feel safe once again. Zoe Connolly stepped into the room and could feel the familiar vibrations of the Time Tunnel. Nearly limitless power flowed through the entire facility. For Zoe, the feeling of finally returning home was exhilarating. Her brother Phin greeted her at the door. His first question reminded her there was work to be done. She would celebrate her homecoming later. Phin: "Ava is ready for time-port. Shall I confirm?" Zoe: "Did she have anything to report before her last letter?" Since radio transmissions between points in time were not possible, communications were actual physical objects that could be teleported in space-time. 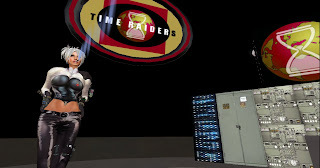 TimeForce 10 crews had long ago shortened the phrase to time-ported, instead of the cumbersome "teleport in space-time". Cards and letters were messages time-ported between agents. Packages were time-ported objects like artifacts, supplies, or weapons. To the untrained ear, this type of jargon made TF10 chatter seem much less interesting. Which is exactly what Zoe and Phin wanted. Phin: "It was a routine letter, Z. She's just ready for her next mission. I think she needs a change." Phin smiled. Zoe could read it later, but Ava was itching for more action and a new mission. Zoe: "I've got as much work as she can handle." 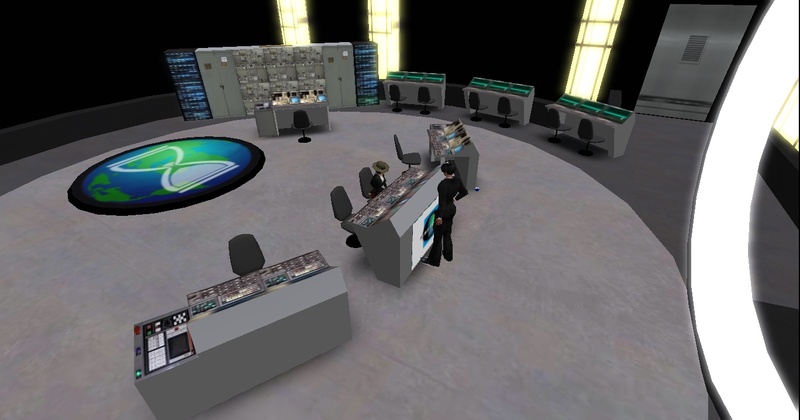 Phin set dials and punched buttons to begin the startup procedure and countdown for timeport. Phin smiled at Zoe and said "She MUST want something new very badly. You know how she gets nauseous after timeport"
Ava was a proud Russian woman and hated to admit to such weaknesses. Zoe laughed and turned to Phin "Shall I get a bucket and mop just in case?" Phin smirked "Let's bring her back and see what happens"
Mademoiselle Kenaan sat in her favorite cafe, contemplating her life and what she had to do next... but the young KC Kenaan was preoccupied with the thoughts of a certain anniversary. Her mind drifted back to the summer of 1940 when the Nazi's first occupied her homeland. She had begged her father for permission to join the Resistance, but he would have no part of it. "It is not work for young girls" she remembered him saying. 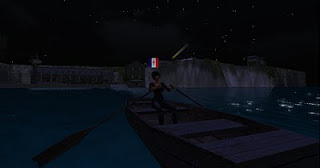 Her older brother Jean-Pierre was allowed to join and soon became a leader within her town. JP would fill her in on all the activities of local operations. KC's eyes filled with tears as she recalled the day. ...The day when the Gestapo came for her brother. It was a bright new day with a new purpose. Following a long absence, Zoe Connolly returned to Professor Fanshaw's secret laboratory and consulted with the residing computational device. A very chatty machine, indeed. Computer: "Miss Connolly, so good to see you! You look quite fetching today." Zoe smirked "You always were a charming sort." Computer: "Have you returned to us, Miss?" Zoe smiled brightly "Indeed I have, and without further distractions." Computer: "Oh that's ripping news, Miss Connolly! The others will be so pleased, I'm sure of it. Shall I give you the latest status report?" Computer: "My report is not at all good, Miss. Your return is most fortunate for us all"
Zoe tilted her head and frowned. She listened to a long list of unusual and distressing natural and man-made phenomena not known to the general population. 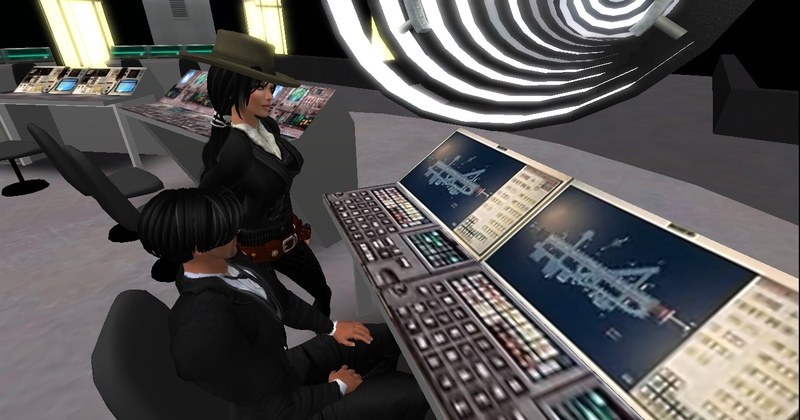 Zoe sighed and made a list of agents, their skills and outlined mission goals. She whispered to herself "Once more unto the breach, dear friends, once more." After completing the list, the computer paused for a moment. Then it said: "It is time to save the world again, Miss Connolly."